As one of the leading bathroom product and sanitary ware manufacturers in China, EAGO’s series range from intelligent steam shower houses and shower enclosures, through to massage bathtubs, common acrylic bathtubs, water closets, and glass, acrylic and ceramic washbasins. Dedicated to supplying high quality products at reasonable prices, EAGO has attained ISO9001 quality certification, and now exports worldwide. Until now, EAGO has exported to clients in the USA, Canada, UK, Norway, Italy, Malaysia, Thailand, South Korea, and several Middle Eastern nations. 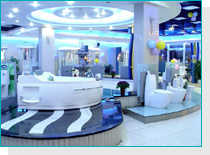 Having received 'CCC' and 'CE' product approvals, the steam shower houses and massage bathtubs are also insured by the People's Insurance Company of China (PICC). The first sanitary ware manufacturer to receive ISO9001 (version 2000) certification in China. The first sanitary ware manufacturer to have its products insured by the PICC in China. The first manufacturer to add a voice-prompt function to steam shower house products in China. For more information, please feel welcome to use our web site and contact us directly. We hope to hear from you in the near future. Use of content without written agreement is forbidden. © 2004 - 2006 All Rights Reserved.